Viacom (VIAB) beat analyst expectations on adjusted earnings numbers for the third quarter of 2018 but missed out on revenue by a whisker. The company reported total revenues of $3.23 billion, down 4% from the third quarter of 2017. The stock was trading marginally down before the bell. On a GAAP basis, net earnings attributable to Viacom were $522 million or $1.29 per share compared to $683 million or $1.70 per share last year. EPS from continuing operations dropped 25% to $1.27. Adjusted EPS from continuing operations came in at $1.18, beating market estimates of $1.07. 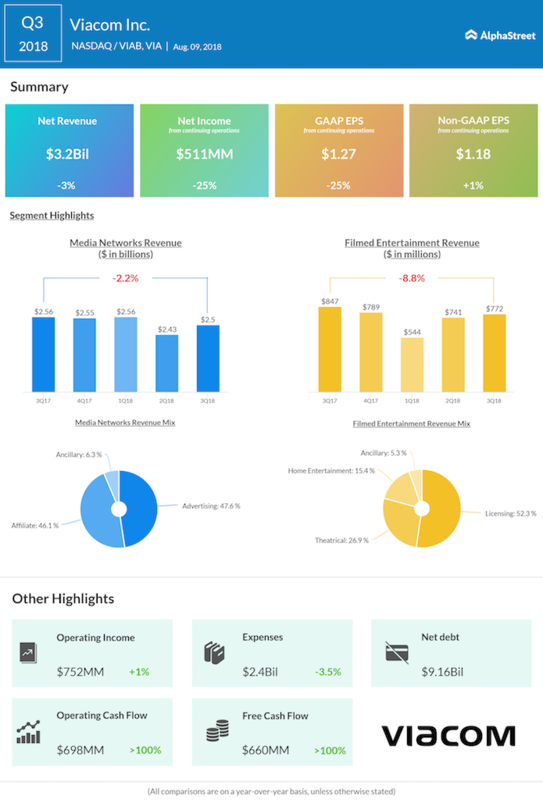 Media Networks segment saw a drop in total revenues, hurt by decreases in advertising and affiliate revenues. Domestic and international revenues both decreased 2%. Filmed Entertainment too saw a decline in total revenues, as the 20% increase in domestic revenue was offset by a 33% decrease in international revenue. Theatrical revenues declined 21% on an overall basis. Domestic theatrical revenues grew 58% driven by the strong performance of A Quiet Place and Book Club. International theatrical revenues fell 58%. A Quiet Place grossed more than $188 million to date domestically, becoming the second highest grossing horror film in the US in the last ten years. Licensing revenues improved in the quarter while Home Entertainment revenues saw a drop. CBS Corp. (CBS), with whom Viacom is considering a merger, reported revenue and earnings increases last week for its second quarter of 2018. CBS is also dealing with misconduct allegations against its CEO Les Moonves. Shares of the media conglomerate, which is facing competition from video streaming service majors like Netflix (NFLX) and Amazon (AMZN), have lost about 7% both in the year-to-date period and last one year.